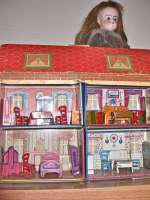 Antique Gottschalck Stable w. upper level Dormer. Ca 1880. Germany, early wood stable with upper level dormer featuring opening door & paper litho covering, stalls well detailed interior includes separate stalls & wall mounted hay feeders, open wagon appears in one stall to complete display. Size: L. 23" H. 17-3/4". D. 7". ( L. 59 cm. H. 42 3/4 cm. T. 18 cm.) Condition: Some , paper loss overall still has a very good condition look. 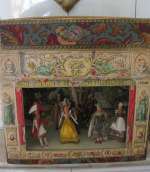 All Original Antique French Wooden Theater with 8 wooden Dolls. France 1850. A rare antique model of a wooden framed French theater in original condition. Fine backdrops and curtains. The dolls are all original and very early. Made of hand carved wood and papermache, painted. The dolls are dressed in their antique outfits with various decoration and gold trimmed paper and silk. Holders in metal. Theater is 14-1/4"/36 cm high, 14-1/4"/36 cm wide, 6 3/4"/ 17 cm deep. Dolls are 3 1/8" (8 cm) tall. Excellent condition for this antique set. France - Circa 1850. Please contact me for additional information. 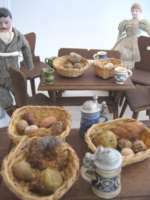 Antique rare and early tin " Rauchfangküche" kitchen by Rock and Graner. Germany ca 1850. 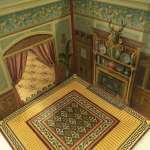 This is a wonderful large early dollhouse kitchen / roombox with a huge amount of contains.German.The kitchen has the original painting and furniture the in a dark blue color.It is from about 1880. Wonderful details. 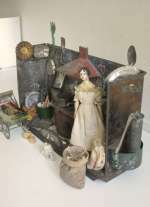 It comes with the contents shown: furniture, stove in tin and miniature most in enemal, Copper tin, china and stoneware.Excellent condition. I will make more photos on request. Note: Doll not included. W. 60 cm /24". H. 29 cm/ 11,5" D. 32 cm /14" No repairs or restoring.